Lebeck, Harold Edgar (Ed) Passed away Dec, 2015. 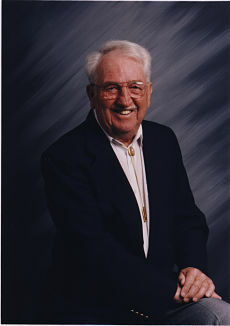 Born July 21, 1920 in Fairview Montana to Larry and Gladys (Newlon) Lebeck. They moved to Santa Barbara in 1924 just before the 1925 earthquake. He went to all the local schools. As a young man he spent many hours at the harbor and learned to sail. In his late teens he crewed on many sailing yachts and sailed in many yacht races around the world. He was a local abalone diver for local businesses. He joined the merchant marines and received his ship harbor pilot’s license. When World War II broke out he joined the navy. Having diving experience, he became a chief bosun’s mate and a hard hat diver. He was one of the heroes at Pearl Harbor along with other divers who saved lives. He worked for Pac-Bell for several years, then went into business for himself opening Lebeck’s Fixit shop. Then he and three partners opened the first coin operated laundries in Santa Barbara. In 1966 he went to work for Delco Electronics as a lead Mechanical Engineer on the hyper velocity gun range. After 26 years at Delco he retired and traveled the world. In 1955 he was the cofounder of the Goleta Valley Railroad Club a model live steam hobby. The hobby was a great outlet for his mechanical skills. He was always building something for his trains. He had several patents for medical devices he built for local doctors. He will be missed by all of his family and friends. Survived by sons John and Terry (Ojai) and daughter Susan Lebeck Peel of Omaha. He had four grandchildren. Jason Lebeck, Lisa Lebeck Finch (Brian), Lindsay Peel Marquarddt (Nick), and Eric Peel (Michelle). Five great grandchildren Randy Lebeck, McKenzie Finch, Hailey Finch, twins Jordan and Cooper Marquardt, & Henry Peel. His ashes will be scattered aat sea. In lieu of flowers donations may be sent to: Santa Barbara Maritime Museum 113 Harbor Way #190, Santa Barbara, CA 93109 in memory of Harold Edgar Lebeck.